Use of a â€œcutawayâ€ model to facilitate better understanding of spatial ambiguity issues within complex mechanical objects has been around since the Renaissance. Needless to say, in the world of small arms design, development and demonstration, a non-firing factory cutaway serves many practical uses as well as come in a variety of forms. But, all have the common purpose of providing extended or amplified visual appreciation of the inner-workings and operation of one or more features of the gun. Some are partially sectionalized at prescribed finite locations only, while others are fully skeleton- ized, depending upon the model-makers assignment or objective. In some or even many cases, a simple 2-dimensional drawing in a sectioned format might well accomplish the objective to the eye well trained to know how to read it. Nevertheless, there is no equal to a 3-dimensional cutaway of a converted real firing rifle for bringing both the eyeball and human brain into optimum synchronicity. 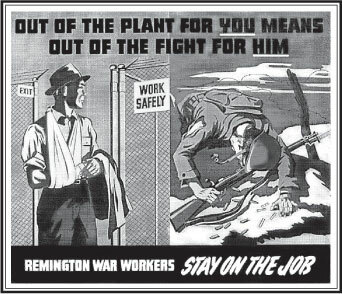 Few of these original WWII Remington factory posters survive. 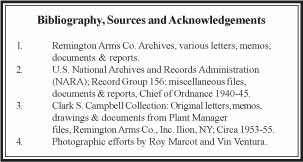 History shows that the Remington Arms Company (RAC) agreed in December 1940 under wartime urgency to consider manufacture of the Springfield Model 1903 bolt action rifle for the British government in .303 caliber. Except for basic modifica- tions adapting it to a different cartridge and related alterations, the task before them was not particularly difficult or complex. The world renowned â€œSpringfieldâ€ rifle had already attained its developmental zenith. Nothing significant remained to do but get on with the job of the alterations and production. But, it didnâ€™t take long for the U.S. War Department to decide that if Remington were to make rifles from this tooling, they would be made to U.S.standard sonly… allwhile respecting an Allied commitment to the United Kingdom (UK) for defense aide. Production of the new U.S. Garand M1 rifle wasnâ€™t proceeding nearly rapid enough. Moreover, the Roosevelt administration had an ominous long-view of not being able to stay out of this war. So, the RAC job was sud- denly even more simple and straight-forward. The need for any re-engineering, modeling and testing, thus a need to sectionalize rifles for intricate study or demonstration was believed at the time to be unnecessary. In fewer words…just crank up the tooling and manufacture the rifle as is. If cutaway versions were to become desirable for training or some other reason, they could likely be borrowed from U.S. Ordnance/ Springfield Armory (SA). verify operational utility, provide whatever essential training was needed to their shop personnel and go into production. Their exclusive contract with the UK as fully collaborated by the US War Department called for a one time effort to make a limited number of rifles in Caliber .30-06 at a production rate estimated nominally at 1000 rifles per day, based on what the 20 year old tooling could reputedly handle. Once again, history reveals the foregoing plan was short- lived. As rifle component manufacture got underway in June 1941, it soon became evident the equipment wasnâ€™t capable of making a rifle meeting the U.S. Armyâ€™s current design drawings and specifications for the M1903A1. Numerous design upgrades had been made over the years related to improved function, safety and manufacturing that required significant reconcilement. However, on top of the need to bridge an antiquated tooling and time gap, inadequate formal records had been kept by Ordnance documenting many of the revised standards and practices adopted during this period. How to economically and expeditiously resolve these matters didnâ€™t always come easy over the months that followed. Indeed, coupled with addressing shortages of strategic materials, such reconcilement often turned into a folly of mind-changes after decisions and direction had already been given. Delayed production schedules became an issue aggravated by re- engineering compromises to be considered, tested and ap- proved to best achieve what had become an emergent hybrid. Meanwhile, the U.S. Government decided to usurp the British contract in September 1941 when â€œLend-Leaseâ€ priorities finally caught up with sufficient funds availability to permit U.S. take- over of the contract. But, the worst had not yet come. The dastardly Japanese attack of Pearl Harbor the follow- ing December abruptly brought an unanticipated reality that devastated the entire scenario then well underway. RAC rifle- making operations had to radically change…and fast. With introduction of the U.S. into World War II (WWII), it suddenly became the U.S. Army that needed more rifles and faster production in spite of their contractual obligation to the UK. While the British Commonwealth eventually did receive the first fruits of production beginning January 1942, thereafter, the War Department explicitly upped the RAC contract for the venerable old bolt rifle twice more to meet U.S. needs…once in February to 2000 rifles per day, then a month later to 3000 rifles per day. any increase. As if the grand awakening to a 20-year obsoles- cence from design and specification upgrades since WWI wasnâ€™t enough, an increase in production to 3000 rifles per day was a virtual impossibility without a large scale transformation of both rifle design and manufacturing methods. At that moment, it was an incredibly insane demand or expectation! Fortunately, key vanguard personnel within the RAC in cooperation with the Ordnance Department had already sensed what was coming. The esoteric reality of the Springfield was about to be challenged. Ushered in on top of numerous changes already made and approved in manufacturing the rifle through mid-January 1942, the new mandate cried out for revolutionary simplification of both the rifle as well as the means of producing it. By early December 1941, the Ordnance Department had already approved hundreds of design, machine tolerance and material-use changes to the initial M1903 â€œModifiedâ€ to further reconcile issues with a critical war materials shortage, the antiquated equipment being used, failure of Ordnance to supply critical tooling gauges and the new AXS-619 Specification adopted to enable production of an acceptable rifle. Many were targeted to such superficiality as materials selection, outward final-finish unrelated to rifle function, parts tolerance intricacies not deemed particu- larly critical and elimination of extraneous mechanical and visual features regarded as too costly or unnecessary for a battle/combat rifle. So, anatomically, the rifle had already become a hybrid version of its Springfield Armory (SA)- made predecessor. But, the transformation had only just begun. By the time the order to radically increase production came, they were already well oriented to the enormity of the task that lay ahead. This new mandate essentially cried out for birthing an entirely new breed of the venerable M1903, one that would ultimately become known as the M1903A3! This article is not about the myriad details constituting innumerable design and manufacturing changes introduced by the RAC, particularly after the December 7, 1941 debacle. Suffice to say, shortly thereafter and through Ordnance approval for manufacture of the M1903A3 prototype in June 1942, it had become essential to comprehend the inter-workings of the rifle being made to a far greater degree. In getting there, the RAC faced an extraordinary constellation of design, developmental and manufacturing challenges that had to be verified as viable, cost effective an interchangeable with the existing M1903 then in use by the Army. But, more important, the process for doing so had to all be compressed into a foreshortened time-frame to not disrupt current production. Having entered this war, there literally was no gratuitous time permitted for a normal compliment of experimental runs, pilot production protocol or extensive testing. To accomplish this, the RAC had to rely heavily on the empirical genius and experience of their small arms engineers and designers at the Ilion plant burning midnight oil. At the risk of being repetitive, the one thing history cannot forget is that the RAC wasnâ€™t being permitted to produce a new rifle iteration failing to recognize component interchangeability with the current or original editions being superseded. In other words, whatever the changes being proposed, parts interchangeability still had to optimally meet Ordnance functional requirements for rifles already in circulation as well as the new rifle…no easy task. analytical efforts during the February-June 1942 period as components were being redesigned with tolerances that both honored the functional integrity needs of the emerging new battle/combat rifle, but still compatible with its more refined predecessor…all without compromise. It was a phenomenal multi-step undertaking inasmuch as tolerance adjustments up to one-10 thousands of an inch had become critical in numerous instances. The pre-existing drawings on file as originally received from Ordnance for the M1903A1 were essentially trashed; the RAC was now on their own with this caper and they knew it. Often, it took repeated efforts over the months in the face of hurried judgment to find suitably optimal points of compromise. Indeed, some of the proposals the author has recently uncovered in factory archived â€œChange in Manufactureâ€ records (CM-Form 5156) were actually approved by Ordnance, and then later rescinded. Some were fully implemented before being changed back to a prior approval and yet others never made it into production at all, thus adding further confusion to todayâ€™s â€™03 collector community. Indeed, most of these collateral efforts remain unknown to most collectors, nevertheless demonstrate for posterity the unlimited range of options pursued by the RAC towards their penultimate objective to reduce costs and accelerate production. from George H. Hartâ€™s Figuring Book No. 257. The bound Figuring Book medium/methodology was a RAC requirement of all engineers and draftsmen to document any laborious analytical undertaking made up of drawings and computations indexed for the permanent record. Mr. Hart was one of many technical designers tasked with assessing and analyzing permissible tolerance changes for the rifleâ€™s interactive parts leading to relaxation of manufacturing â€œworking standardsâ€…while not negating proper component assembly, fit and function. Plate No. 1 is a just a sampling. 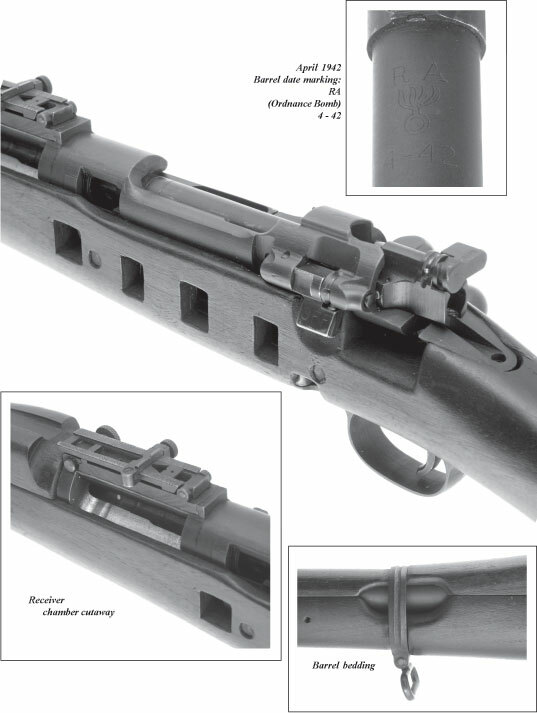 It dealt with the relationship between the Barrel and the Fixed Base (rear sight). It also denotes what the engineer ultimately used to design and model final components, thus subsequent manufacturing drawings, gauges and tooling set-up. Plate No. 2 is a copy of a typical â€œChange in Manufacture.â€ C.M. No. 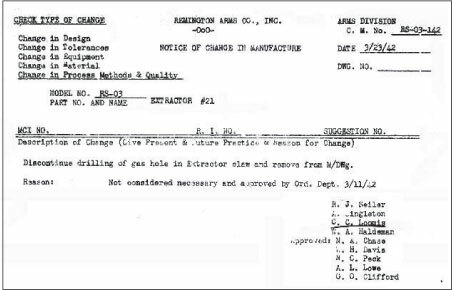 RS-03-142 formally recorded a change to â€œdiscontinue drilling of gas hole in extractor claw…â€ on March 23, 1942, after the Ordnance Department deemed it no longer necessary on March 11th. Both Plates 1 and 2 are representative of the monumental effort behind the scenes not heretofore made public that lead to literally thousands of changes in materials selection, parts redesign, machining tolerances, process methods and final quality decisions, along with subsequent reductions in machine use. After the production objective went up to 3,000 rifles per day, both ideas for change and approvals became more radical and rapid. Ultimately, as approvals were given to Remington based on affirmation of extraordinarily convincing presentations to an anxious Ordnance Department, it became necessary as a practical matter to evaluate and affirm the effects of such changes in rifle function to everyone involved in the manufacturing process. In other words, educating & convincing Ordnance personnel, training technicians, engineers and manufacturing personnel to translate such approvals into altered tooling and production methods that were realistically doable, required frequent use of the best visual and modeling methods known at the time that could be quickly mobilized. As paramount as cutting open a cadaver is to a medical examiner/coroner, clinical morphology had once again arrived on the rifle manufacturing scene. The technical command at RAC decided intricate study and revelation of the M1903â€™s anatomy had become sufficiently critical to the undertaking, that a cutaway version of the rifle had an crucial role to play. It is unknown how many cutaway rifles were fabricated by Remington Arms craftsman during their WWII experience. Little detailed information from ongoing archival research has been found to date that specifically deals with the RAC cutaway modeling program per se, thus leaving general records and the physical examples remaining to speak for themselves. 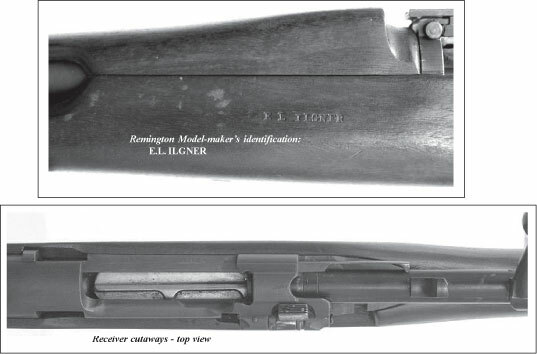 With the exception of some two- dimensional sectionalized drawings of the M1903A3, extant evidence seems to point to most if not all the three-dimen- sional cutaway conversions made from firing rifles were manufactured in the first 6 months of 1942. In the research leading up to his incomparable tome published in 1985, noted â€™03 author, collector and researcher Bill Brophy was shown â€œ…six different examplesâ€ by RAC museum curators…all fabricated in 1942. The dates on these samples are likely no coincidence since being the very time-frame during which RACâ€™s developmental effort for re-engineering the M1903 was most intense. For example, the one featured in this article has a barrel date of April 4, 1942 and carries a unique identification (I.D.) stamp of â€œXG0480â€. Note: Beyond simplistic speculation by the author (Experimental Gun), there is no known certainty for translating the significance of this I.D. nomenclature. Most of the specimens Brophy observed were apparently made from salvaged scrap and unserviceable parts. However, not all were manufactured exclusively from discarded parts alone. After close examination, the one photographed for this article appears to have been largely assembled from new parts obtained directly from rifle-assembly stations during manufacture. In other words, with the exception of the receiver, which is neither serially stamped nor roll-stamped with manufacturer identification, most all the parts were final inspected and/ or finished per specifications. This includes the barrel along with a correct stock containing all expected inspec- tion stamps prior to firing proof/final approval. 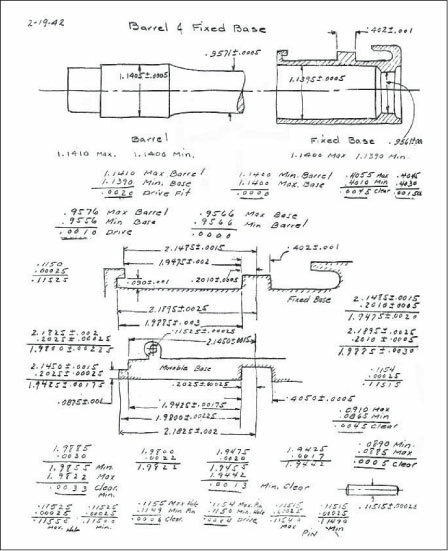 Brophy also noted from his examination of the six RAC cutaways, the â€œ…sectionalized features were done to the left side of the rifle, whereas the Armory ones were machined and sectionalized on all sidesâ€. It is likely no coincidence, therefore, that all the RAC â€œcutawaysâ€ appear to have followed the same directives for what, where and how the specific locations to be cut-a-way were chosen. In that regard, the sample featured in this article is essentially identical to the one on page 239 of Brophyâ€™s book. Nevertheless, they werenâ€™t all created by the same model-maker. For example, the one Brophy featured was credited to a RAC employee by the name of â€œBellâ€, whereas the one shown herein was a product of â€œE. L. Ilgnerâ€. It is noted that Remington Arms employed numerous skilled model-makers during the War effort in a wide variety of projects. Suffice to say, the WWII Remington-made cutaways were created by a number of skilled craftsman as the need called for them over a relatively short period of time. However, they all seem to follow a uniformity specification for what or how they were to be used, whether classroom, research laboratory models or demonstra- tion to Ordnance officials. Close examination of XG0480 reveals a proximate correlation between its sectioned features and the effects of tolerance control in moving parts engagement, the relationship of stock-wood removal & barreled action bedding, and numerous other areas having become subject to changes documented by engineering studies and resultant CMâ€™s still on file with the RAC dating from early 1942. In closing, this was an intense time in WWII history. More important, it was another example of an exemplary contribu- tion in a long life of dedicated wartime service to our nation by the Remington Arms Company. 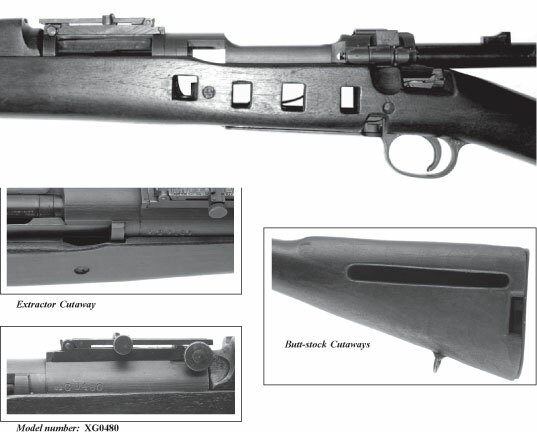 A cutaway version of the rifle had become an integral part of the overall effort with XG0480 a lasting testi- mony to vital evidence and tribute.